These winter months can be difficult and challenging our our little ones, so do take some time to check all their needs are being catered for throughout the winter months - and especially when the temperature drops, winds get stronger and snow starts to fall. Because of the additional challenges and stresses the winter months can present, it’s important to ensure rabbits, guinea pigs and other herbivores have access to lots of fresh quality hay to help their digestive systems cope. Our outdoor friends will need extra attention to ensure they are coping with the falling temperatures. Use suitable insulation around the accommodation, provide extra hay and straw for snuggling and relocate into an outhouse (garage etc) if the temperature gets too low if at all possible. Even a cardboard box filled with straw can provide extra insulation and help maintain warmth. Remember that whilst rabbits in the wild do live outdoors, they don’t live above ground and they cope with low temperatures by living together in burrows which have a fairly constant and comfortable temperature all year-round. 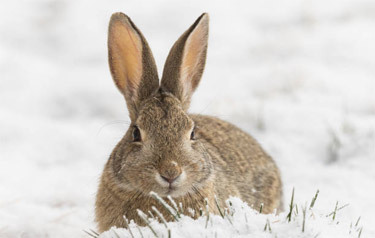 Some rabbits may enjoy the snow (if it does arrive), but remember that indoor rabbits won't be used to the cold and should be monitored carefully if let outside for any time at all - and dry them off before letting them settle back indoors. Double check the accommodation is both safe and secure. Pet theft is common (so padlocks are essential) and predators, such as urban foxes, will happily open an unsecured catch or break into weak structures - they will also become more determined as temperatures fall, so do check accommodation daily for damage. Background heating can be provided by low level (safe!) heating, such as oil filled radiators, but make sure the wires are well out of reach. Several types of rabbit-safe heat pads are also available, and these can both keep your little ones warm and help prevent water from freezing too! Make sure you’ve got plenty of supplies (loads of hay is essential! ), and make sure you’ve got access to any healthcare products you think you may need, such as recovery feed, that you feel your little ones may need over the winter. Check when your local vets are open, and keep any out of hours emergency numbers handy too. Keep your little ones safe and warm!